Blogs are an increasingly popular type of web site - they are kind of like online journals. ASP scripts for running a Blog. Requires a web host that supports ASP. CGI and Perl scripts for running a Blog. Requires a web host that supports CGI. PHP scripts for running a Blog. Requires a web host that supports PHP. Remotely hosted Blog services. These may be a good choice if your host does not support ASP, CGI or PHP. Teaches You How To Set Up And Profit From A Successful Blog. Start Making Money From Blogs By Following This Step-by-step, Weekly Coaching Program. In this how-to guide for lifestyle blogging basics, Laura breaks down how she got started with her first blog, how she progressed to where she is now, and what failed attempts at success she made along the way. The book begins with Laura covering the essential groundwork of discovering your niche, defining your content categories, choosing a blog name, selecting a platform, and creating a healthy and attainable blogging routine. Then, she takes a deep dive into describing the the most effective ways to invest in yourself and your blog by explaining the importance of quality design, high resolution photos, email marketing services, and more. You’ll also learn how to partner and collaborate with brands by building an online media kit, how to promote your blog on social media, and how to create a thriving community around your blog that will stand the test of time. A complete update to the ultimate reference guide on blogging basics! The increase in the number of blogs is seemingly endless and continues to grow at a phenomenal rate, thanks in part to the rise of smartphones, tablets, and blogging applications. With this kind of popularity, how can a blogger stand out from the rest of the masses? This all-in-one guide is packed with detailed information and advice that helps you create and solidify your place in the blogosphere. You’ll learn how to get started, use blogging tools, collaborate with other bloggers, become a part of mobile blogging, and much more. Blogging All-in-One For Dummies, 2nd Edition cuts through the clutter and offers you a fun and friendly reference guide to starting and maintaining a successful blog. Ever wondered why some bloggers earn six- or even seven-figure incomes while most struggle to make their first $1000? What strategies, habits, or systems have led to their success? To answer these questions, Sally Miller interviewed 17 top bloggers across various niches. She examined their business strategies. Looked for common themes. Researched their backgrounds, habits, and characteristics. The results of this research are fascinating. While no two bloggers earn money in the exact same way, they do all share some common traits. The Essential Habits Of 6-Figure Bloggers is a collection of real-life stories. It’s also a success manual for bloggers. 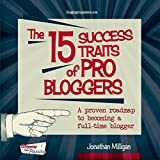 In this book, the author lays out the three essential habits of six-figure bloggers. These habits are not about specific tactics (though these are covered). They go deeper. In fact, you can apply these three habits to anything. Not just blogging. Want to lose weight? Pay off your debt? Build a retirement fund? Run a marathon? Practice the three success habits and you can achieve anything you want in life. The ideas in these pages aren’t new. Instead, this book provides a framework so that you can sort through the mass of information, tools, and techniques and create your own version of success. You’ll learn the three habits and how to apply them to your blog, or any other situation. When you read this book you will learn from top bloggers, master the three success habits, and create a six-figure blog that leverages your unique talents and experiences. * Pick a blogging niche that's profitable and exciting. * Earn money from your blog - using six proven monetization strategies. * Create systems to stay on track – even when the going gets tough. * Dream bigger than ever before and achieve anything you want. While blogging is not a get-rich-quick scheme, it is a flexible and fulfilling way to make money from home. In this book you will meet bloggers who are earning six- and even seven-figures a year. If you love to write and have a message to share, you can do this too. How would your life change if you could build a profitable, online business you love? When you read this book, you will learn from those who are already doing what you want to do. You’ll discover what it really takes to create a six-figure blog. Get your copy today by clicking the BUY NOW button at the top of this page! You have great info to share and need a platform to reach as many people as possible? You are running a business and are looking to increase traffic to your website?You are looking to blogging as an income source?If any of this rings true, this book is for you!It will give you the tools to get started in easy-to-understand language. Plenty of pictures to illustrate each step, as well as a massive resource chapter for further training. Download now and start your blog today!Scroll to the top of the page and select the "buy" button. Do you want to earn a living doing what you love? Whether you have been blogging for years or just a few weeks, How to Blog For Profit (Without Selling Your Soul) offers solid advice and practical action plans for creating an authentic, successful, and profitable blog. With wit, wisdom, and the insight of someone who’s been there, Ruth Soukup shares how she grew her own blog, Living Well Spending Less, to over one million monthly visitors, earns a full time income, and still is able to write about the things she truly cares about. • Stop comparing your blog to those around you and instead learn to leverage your own unique assets. • Discover the secrets to creating amazing, compelling blog content that brings readers back again and again. • Learn how to increase your blog traffic and build solid platform through field-tested strategies. • Develop a solid social media strategy for capturing viral growth through Pinterest and Facebook. • Dramatically boost your revenue through diversified income streams. • Improve your productivity, learning to work smarter not harder, and take concrete steps to transform your blog into a business. Finally a go-to guide to creating and publishing the kind of content that will make your business thrive. Everybody Writes is a go-to guide to attracting and retaining customers through stellar online communication, because in our content-driven world, every one of us is, in fact, a writer. If you have a web site, you are a publisher. If you are on social media, you are in marketing. And that means that we are all relying on our words to carry our marketing messages. We are all writers. Yeah, but who cares about writing anymore? In a time-challenged world dominated by short and snappy, by click-bait headlines and Twitter streams and Instagram feeds and gifs and video and Snapchat and YOLO and LOL and #tbt. . . does the idea of focusing on writing seem pedantic and ordinary? Actually, writing matters more now, not less. Our online words are our currency; they tell our customers who we are. Our writing can make us look smart or it can make us look stupid. It can make us seem fun, or warm, or competent, or trustworthy. But it can also make us seem humdrum or discombobulated or flat-out boring. And so being able to communicate well in writing isn't just nice; it's necessity. And it's also the oft-overlooked cornerstone of nearly all our content marketing. In Everybody Writes, top marketing veteran Ann Handley gives expert guidance and insight into the process and strategy of content creation, production and publishing, with actionable how-to advice designed to get results. These lessons and rules apply across all of your online assets — like web pages, home page, landing pages, blogs, email, marketing offers, and on Facebook, Twitter, LinkedIn, and other social media. Ann deconstructs the strategy and delivers a practical approach to create ridiculously compelling and competent content. It's designed to be the go-to guide for anyone creating or publishing any kind of online content — whether you're a big brand or you're small and solo. Giving your audience the gift of your true story, told well. Empathy and humanity and inspiration are key here, so the book covers that, too. Best practices for creating credible, trustworthy content steeped in some time-honored rules of solid journalism. Because publishing content and talking directly to your customers is, at its heart, a privilege. "Things Marketers Write": The fundamentals of 17 specific kinds of content that marketers are often tasked with crafting. Content Tools: The sharpest tools you need to get the job done. Traditional marketing techniques are no longer enough. Everybody Writes is a field guide for the smartest businesses who know that great content is the key to thriving in this digital world. A planning and editorial system designed for ambitious bloggers and solopreneurs to create intentional content, grow and nurture an audience and build a business around your blog. If you’re nodding yes to any of the above, you’re not alone! Navigating everything you need to do and know to build a blog and business can be challenging and overwhelming. This is where the CREATE Planner comes in. The CREATE planner keeps you focused on your blogging goals by tracking and analyzing what matters most. It puts the right questions in front of you to help you understand your audience better and to create content designed to showcase your products and services. This 246-page CREATE planner is undated, designed to be picked up at any time of the year and has plenty of space to hold your creative thoughts, ideas and scribbles. If you’re ready to create a plan for your blog, hold yourself accountable, track your progress and make major strides in your blog and business, scroll to the top and click or tap "Buy Now". Create exceptional content, get more done and smash through every one of your blogging goals. This is the editorial planner every blogger needs. I spent years wanting to start a blog. I hated my job and knew I didn’t want to spend a third of my day miserable…but looking through blogging books, all I found were generic strategies and false promises.They all promised huge income but none really told me how much bloggers make or how to make money online. I said screw it and started my blogs anyway in 2014. I quit my job and spent 60+ hours a week building my sites and learning how to make money blogging. You know what, it paid off. I doubled my monthly income last year and now make more than 85% of bloggers. That’s in just two years of blogging and I make money from seven different income sources every month. Flip-flops and a T-shirt are my uniform and I’m loving it! The nine ways to make money I detail in this book helped me grow my income to over $5,000 a month. More than a work from home reference, each chapter is a step-by-step in getting started and maximizing your income from each source. Some of the strategies to make money are completely passive once you set them up. Others will take more work but can make thousands a month. The one thing they have in common...they all work! You Don’t Have 60+ Hours a Week to Learn How to Make Money Online? I didn’t start making money blogging overnight. I treated it like a business, I put everything into it and sacrificed life for months to learn how to start a blog and be successful. My pain is your gain. You don’t have to sacrifice a year of your time to start making money and work from home. I put everything I learned on my own into this book from the easiest ways to make money to the methods that make thousands a month. This isn’t just another generic blogging book, covering everything from starting a blog to building traffic and then offering a side-note on a few ways to make money.You can find that anywhere. Type ‘Start a Blog’ in Google and you’ll find thousands of articles on how to setup your site but none of them tell you exactly how to make money. Believe me, I tried and had to learn the hard way. This book is 100% dedicated to giving you the tools that make money on websites. I'm not promising you a get rich quick scheme or a way to make money online without doing any work. All nine of these blogging strategies take time to set up and some require continuous work on your part. Anyone that promises you online riches without the work is just trying to scam you. What I am promising is a complete guide on making money blogging, from strategies that will start making money today to the ones that make the most money. You'll learn what works for your blog and how to combine them all to make more than you thought possible blogging. I want you to be successful. I want you to see that it is possible. That's why I'm offering a 100% guarantee. If you don't like the book, if it doesn't help you make money blogging, return it for a full refund. If you are serious about working from home and making money online, click buy now. Would you like to learn how to optimize your blog for profit? Perhaps your a beginner wanting to take your blog to the next level . How To Start A Profitable Blog: A Guide To Create Content That Rocks, Build Traffic, And Turn Your Blogging Passion Into Profit contains valuable information on how to optimize your blog and how to kick-start your income stream. you'll get a simple system for starting a successful blog that readers love! Blogging isn't just for sharing your thoughts with the world; it has become a leading platform for real business. Most people read blogs for selfish reasons or for just entertainment. Their loyalty largely depends on how much value or engagement you provide. question that people have about your website. 5. Optimization, and Much More! You can start a successful, and profitable blog! Just follow this guide and you'll learn how to do it. Grab your copy today, and take your blog to the next level. Scroll to the top of the page and select the 'buy button'.